Lavender may be helpful in the treatment of anxiety and depression. It may also improve breathing, relaxation, and sleep. In studies that use massage along with lavender aromatherapy, massage may be more responsible for some of the benefits. Several studies suggest that lavender may reduce anxiety, depression, and pain, and improve sleep. In other studies where lavender is used with massage, benefits may be due to the massage, rather than the lavender itself. Only a few studies have evaluated lavender for cancer and related symptoms. In the lab, lavender has several properties that may be helpful against cancer, but human studies are needed. Lavender can cause allergic skin reactions and may increase sedative effects. It may also cause enlarged breasts in boys. Because it has weak hormonal activities, long-term oral or topical use of lavender should be avoided in patients with hormone-sensitive cancers. Some oral lavender formulations have been shown to relieve anxiety. Animal studies suggest that inhaled lavender can either enhance calmness or increase nervousness, depending on whether the animal had calm or nervous personalities. Basic studies have identified some properties in lavender that may be helpful against cancer, but no studies have been conducted in humans. A compound called POH that may have come from lavender or other plants was developed as a nasal spray and showed some benefit in palliative care patients with recurrent gliomas. Lavender did not reduce anxiety during radiation treatment. Two studies that used lavender aromatherapy along with massage did not find an increased benefit because of the use of lavender. A hospital that allowed the use of aromasticks found that lavender was among the most popular, did not disturb others, and improved breathing and relaxation. Because lavender has weak hormonal effects, long-term oral or topical use should be avoided in patients with hormonal cancers. Several studies show that lavender can aid in the treatment of depression. Several studies show that lavender can improve sleep. For one study of lavender aromatherapy with massage in cancer patients, the massage itself was thought to be responsible for the benefits. One study showed that inhaling lavender oil may reduce migraine headaches. A few studies show that lavender oil is effective in treating chronic pain, but the effects are not long-lasting. In two studies with children, inhaling lavender lowered heart rate and pain medication use. Other types of pain relieved with the use of lavender include patients in labor and those who have suffered burns. One study showed inhaled lavender relieved menstrual cramps and emotional symptoms, but the effects did not last long. You are pregnant and nursing: Excessive internal use of lavender should be avoided. 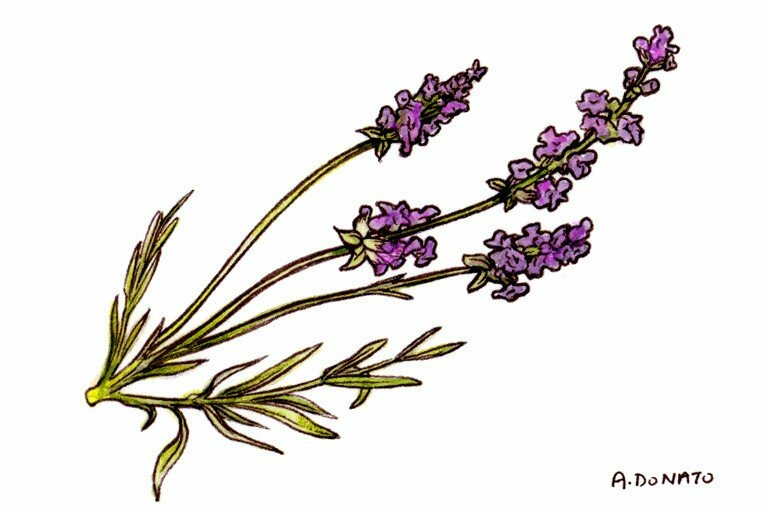 You are allergic to lavender: Skin rash has been reported. You have a hormone-sensitive cancer: In laboratory studies, lavender showed very weak estrogenic and antiandrogenic activities, and it is unclear whether this would lead to any positive or negative effects with long-term oral or topical use. You are taking sedatives or hypnotic drugs: Lavender may increase their effects. You are taking CNS depressants, anticonvulsants: Lavender may increase narcotic and sedative effects. You are taking cholesterol-lowering drugs (statins, nicotinic acid, fibric acid derivatives): Lavender may produce additional cholesterol-lowering effects. Although lavender appears to be well tolerated, it may have weak hormonal effects. Excessive breast development was reported in preteen boys with repeated application of lavender and tea tree oils, as well as perfumes with lavender as a main component. Derived from the flowering tops of the plant, lavender oil is used in lotions and perfumes, in aromatherapy, as a topical treatment, and as an oral supplement for a wide variety of symptoms. Preclinical data show that lavender has anxiolytic (30) (31), anticonvulsant (26) (34), neuroprotective (21) (32) (33), cardioprotective (35), antimicrobial (4) (27) (28), anti-inflammatory (22), and antioxidant (29) effects. Lavender oil inhalation reversed spatial memory loss in dementia models (23). Clinical studies have shown benefits of oral lavender preparations against depression (7) (43) and anxiety (12) (13) (16) (18) (41) (42). Findings of lavender aromatherapy indicate improvements in preoperative anxiety (68) (69), reduction in postoperative analgesics (45) and autonomic response to pain (46). It was also reported to reduce pain and anxiety in burn patients (70), and pain from labor (71) or renal colic (72). Studies using inhaled lavender found improvements in sleep quality (36), post-acute-stress memory and physiologic function (73), dysmenorrhea and emotional symptoms (37) (38), premenstrual syndrome (75), menopause flushing (74), reduced migraine frequency (19), and agitation and falls in older individuals (20). Inhaled lavender was also shown effective in improving symptoms of dementia (5) (15) compared to dermal application (39). Aromatherapy massage with lavender affected psychological and physiological improvements in patients with acute coronary syndrome (76). Preclinical findings suggest anticancer effects of lavender against various cancer cell lines (47) (48) (49). Animal studies that employed the monocyclic terpene perillyl alcohol (POH), derived from several herbs including lavender, showed tumor inhibition and regression (50) (51). But clinical trials did not find effectiveness of inhaled lavender for lowering anxiety during radiotherapy (6); or for enhancing the benefits of massage with lavender oil (8). Anti-inflammatory and analgesic effects of lavender are attributed to 1,8-cineole (2). Other major constituents include linalool and linalyl acetate, which may relax blood vessels and induce anxiolytic effects (30) (40) (54). Exposure to linalool odor has been reported to induce anxiolytic effects without motor impairment in a murine model (77). Lavender oil also has broad-spectrum antibacterial activity (22). It reversed bacterial resistance to piperacillin in multi-drug-resistant E.coli via alterations of outer membrane permeability and bacterial quorum sensing inhibition (27); and prevented immediate-type allergic reactions by inhibiting mast cell degranulation (25). Antimicrobial activity was synergistic or additive when combined with other essential oils, with the most favorable combinations being cinnamon or sweet orange oil against C. albicans and S. aureus, respectively (28). In addition, lavender has depressive effects on the central nervous system (3). In animal models, it displayed neuroprotective effects by attenuating neuronal damage, upregulating catalase (CAT), superoxide dismutase (SOD), and glutathione peroxidase (GSH-Px) activities, and the glutathione (GSH)/glutathione disulfide (GSSG) ratio (21). Activity in stroke models include increased endogenous antioxidant defense, oxidative stress inhibition, and increased vascular endothelial growth factor (VEGF) expression (33). In an Alzheimer’s disease model, lavender extract improved spatial performance by diminishing beta-amyloid production in the hippocampus (32). In mice with anosmia, anxiolytic effects with lavender inhalation were likely due to serotonergic mechanisms rather than olfactory activation (30) (31). However, whether lavender alleviates or exacerbates anxiety may actually be determined by genetic influences on temperament as these behaviors were amplified after exposure to lavender inhalation in calm versus nervous sheep (56). Antiepileptic effects are due to suppression of nitric oxide level in the brain (26). Cardioprotective effects against myocardial infarction are attributed to lavender’s antioxidant properties (35). In wound healing models, lavender oil accelerated re-epithelialization and wound closure via enhanced epidermal growth factor (EGF) secretion (55). In young women with premenstrual syndrome, lavender inhalation increased the high frequency component of heart rate variability, reflecting parasympathetic nervous system activity (37). Although lavender reduced anxiety during urodynamic assessments by increasing gamma-aminobutyric acid inhibitory effects in the amygdala, blood pressure increases were attributed to potential diuretic activity (40). A positron emission tomography study revealed anxiolytic effects may occur via reduced serotonin-1A receptor binding (41). Effects on preoperative anxiety were attributed to both the use of lavender aroma as well as the placebo effect of added attention to patients (68). An aqueous lavender extract inhibited lymphocyte proliferation in Hodgkin’s lymphoma cell lines via apoptosis (47). In addition, lavender extracts and essential oil exhibited cytotoxicity in malignant cells, upregulated Bax expression, and induced PARP cleavage in HeLa cells, and caused a sub-G1 peak in treated cells compared with controls (48). Perillyl alcohol (POH), derived from botanicals including lavender, may affect transforming growth factor (TGF)-beta and/or Ras signaling pathways (59) and Na/K-ATPase inhibition (60). Lavender oil has weak estrogenic and antiandrogenic activities that could alter estrogen and androgen signaling pathways (14). Individuals allergic to lavender; dermatitis has been reported (61). Excessive internal use should be avoided by pregnant and nursing women (61). Long-term oral consumption or long-term topical application should be avoided in patients with hormonal cancers (14). Oral: Nausea, confusion (43); belching (12). Topical: Allergic contact dermatitis (17) (24) and photosensitivity (61). Although lavender appears to be well tolerated, it may have weak hormonal effects (14). Prepubertal gynecomastia (topical): With repeated application of lavender and tea tree oils (14). At the same time, there was considerable discourse as to whether or not other co-ingredients could have been the cause of enlarged breasts (62) (63) (64) (65). In 3 additional boys who were chronically exposed to lavender, two used a cologne, one of which was confirmed to contain lavender. Symptoms improved after the exposure was discontinued (53). Sedatives: Lavender may potentiate their sleep-inducing effects (3). CNS depressants, anticonvulsants: Lavender may increase narcotic and sedative effects (66). Cholesterol-lowering drugs (statins, nicotinic acid, fibric acid derivatives): Lavender may produce additional cholesterol-lowering effects (61). Bagheri-Nesami M, Shorofi SA, Nikkhah A, et al. The effects of aromatherapy with lavender essential oil on fatigue levels in haemodialysis patients: A randomized clinical trial. Complement Ther Clin Pract. Feb 2016;22:33-37. Hajhashemi V, Ghannadi A, Sharif B. Anti-inflammatory and analgesic properties of the leaf extracts and essential oil of Lavandula angustifolia Mill. J Ethnopharmacol. 2003;89:67-71. Gyllenhaal C, Merritt SL, Peterson SD, Block KI, Gochenour T. Efficacy and safety of herbal stimulants and sedatives in sleep disorders. Sleep Med Rev. 2000;4:229-51. Takarada K, Kimizuka R, Takahashi N, Honma K, Okuda K, Kato T. A comparison of the antibacterial efficacies of essential oils against oral pathogens. Oral Microbiol Immunol. 2004;19:61-4. Holmes C, Hopkins V, Hensford C, MacLaughlin V, Wilkinson D, Rosenvinge H. Lavender oil as a treatment for agitated behaviour in severe dementia: a placebo controlled study. Int J Geriatr Psychiatry. 2002;17:305-8. Graham PH, Browne L, Cox H, Graham J. Inhalation Aromatherapy During Radiotherapy: Results of a Placebo-Controlled Double-Blind Randomized Trial. J Clin Oncol. 2003;21:2372-6. Akhondzadeh S, Kashani L, Fotouhi A, Jarvandi S, Mobaseri M, Moin M et al. Comparison of Lavandula angustifolia Mill. tincture and imipramine in the treatment of mild to moderate depression: a double-blind, randomized trial. Prog Neuropsychopharmacol Biol Psychiatry 2003;27:123-7. Soden K, Vincent K, Craske S, Lucas C, Ashley S. A randomized controlled trial of aromatherapy massage in a hospice setting. Palliat Med. 2004;18:87-92. Buckle J. Use of aromatherapy as a complementary treatment for chronic pain. Altern.Ther.Health Med 1999;5:42-51. Hay IC, Jamieson M, Ormerod AD. Randomized trial of aromatherapy. Successful treatment for alopecia areata. Arch Dermatol. 1998;134:1349-52. Sarrell EM, Cohen HA, Kahan E. Naturopathic treatment for ear pain in children. Pediatrics. 2003;111:e574-e579. Kasper S, Volz HP, Dienel A, et al. Efficacy of Silexan in mixed anxiety-depression—A randomized, placebo-controlled trial. Eur Neuropsychopharmacol. Feb 2016;26(2):331-340. Kasper S, Anghelescu I, Dienel A. Efficacy of orally administered Silexan in patients with anxiety-related restlessness and disturbed sleep—A randomized, placebo-controlled trial. Eur Neuropsychopharmacol. Nov 2015;25(11):1960-1967.
Henley DV, Lipson N, Korach KS, et al. Prepubertal gynecomastia linked to lavender and tea tree oils. N Engl J Med. 2007;356(5):479-85. Jimbo D, Kimura Y, Taniguchi M, Inoue M, Urakami K. Effect of aromatherapy on patients with Alzheimer’s disease. Psychogeriatrics. 2009 Dec;9(4):173-9. Woelk H, Schläfke S. A multi-center, double-blind, randomised study of the Lavender oil preparation Silexan in comparison to Lorazepam for generalized anxiety disorder. Phytomedicine. 2010 Feb;17(2):94-9. Goiriz R, Delgado-Jiménez Y, Sánchez-Pérez J, García-Diez A. Photoallergic contact dermatitis from lavender oil in topical ketoprofen. Contact Dermatitis. 2007 Dec;57(6):381-2. Kasper S, Gastpar M, Müller WE, et al. Efficacy and safety of silexan, a new, orally administered lavender oil preparation, in subthreshold anxiety disorder - evidence from clinical trials. Wien Med Wochenschr. 2010 Dec;160(21-22):547-56. Sasannejad P, Saeedi M, Shoeibi A, Gorji A, Abbasi M, Foroughipour M. Lavender essential oil in the treatment of migraine headache: a placebo-controlled clinical trial. Eur Neurol. 2012;67(5):288-91. Sakamoto Y, Ebihara S, Ebihara T, et al. Fall prevention using olfactory stimulation with lavender odor in elderly nursing home residents: a randomized controlled trial. J Am Geriatr Soc. 2012 Jun;60(6):1005-11. Wang D, Yuan X, Liu T, et al. Neuroprotective activity of lavender oil on transient focal cerebral ischemia in mice. Molecules. 2012 Aug 15;17(8):9803-17. Altaei DT. Topical lavender oil for the treatment of recurrent aphthous ulceration. Am J Dent. 2012 Feb;25(1):39-43. Hritcu L, Cioanca O, Hancianu M. Effects of lavender oil inhalation on improving scopolamine-induced spatial memory impairment in laboratory rats. Phytomedicine. 2012 Apr 15;19(6):529-34. Posadzki P, Alotaibi A, Ernst E. Adverse effects of aromatherapy: a systematic review of case reports and case series. Int J Risk Saf Med. 2012 Jan 1;24(3):147-61. Kim HM, Cho SH. Lavender oil inhibits immediate-type allergic reaction in mice and rats. J Pharm Pharmacol. 1999 Feb;51(2):221-6. Rahmati B, Khalili M, Roghani M, Ahghari P. Anti-epileptogenic and antioxidant effect of Lavandula officinalis aerial part extract against pentylenetetrazol-induced kindling in male mice. J Ethnopharmacol. 2013 Jun 21;148(1):152-7. Yap PS, Krishnan T, Yiap BC, et al. Membrane disruption and anti-quorum sensing effects of synergistic interaction between Lavandula angustifolia (lavender oil) in combination with antibiotic against plasmid-conferred multi-drug-resistant Escherichia coli. J Appl Microbiol. May 2014;116(5):1119-1128.
de Rapper S, Kamatou G, Viljoen A, et al. The In Vitro Antimicrobial Activity of Lavandula angustifolia Essential Oil in Combination with Other Aroma-Therapeutic Oils. Evid Based Complement Alternat Med. 2013;2013:852049. Gismondi A, Canuti L, Grispo M, et al. Biochemical composition and antioxidant properties of Lavandula angustifolia Miller essential oil are shielded by propolis against UV radiations. Photochem Photobiol. May-Jun 2014;90(3):702-708. Chioca LR, Antunes VD, Ferro MM, et al. Anosmia does not impair the anxiolytic-like effect of lavender essential oil inhalation in mice. Life Sci. May 30 2013;92(20-21):971-975. Chioca LR, Ferro MM, Baretta IP, et al. Anxiolytic-like effect of lavender essential oil inhalation in mice: participation of serotonergic but not GABAA/benzodiazepine neurotransmission. J Ethnopharmacol. May 20 2013;147(2):412-418. Zali H, Zamanian-Azodi M, Rezaei Tavirani M, et al. Protein Drug Targets of Lavandula angustifolia on treatment of Rat Alzheimer’s Disease. Iran J Pharm Res. Winter 2015;14(1):291-302. Vakili A, Sharifat S, Akhavan MM, et al. Effect of lavender oil (Lavandula angustifolia) on cerebral edema and its possible mechanisms in an experimental model of stroke. Brain Res. Feb 22 2014;1548:56-62. Koutroumanidou E, Kimbaris A, Kortsaris A, et al. Increased seizure latency and decreased severity of pentylenetetrazol-induced seizures in mice after essential oil administration. Epilepsy Res Treat. 2013;2013:532657. Ziaee M, Khorrami A, Ebrahimi M, et al. Cardioprotective Effects of Essential Oil of Lavandula angustifolia on Isoproterenol-induced Acute Myocardial Infarction in Rat. Iran J Pharm Res. Winter 2015;14(1):279-289. Lillehei AS, Halcon LL, Savik K, et al. Effect of Inhaled Lavender and Sleep Hygiene on Self-Reported Sleep Issues: A Randomized Controlled Trial. J Altern Complement Med. Jul 2015;21(7):430-438. Matsumoto T, Asakura H, Hayashi T. Does lavender aromatherapy alleviate premenstrual emotional symptoms? : a randomized crossover trial. Biopsychosoc Med. 2013;7:12. Raisi Dehkordi Z, Hosseini Baharanchi FS, Bekhradi R. Effect of lavender inhalation on the symptoms of primary dysmenorrhea and the amount of menstrual bleeding: A randomized clinical trial. Complement Ther Med. Apr 2014;22(2):212-219. O’Connor DW, Eppingstall B, Taffe J, et al. A randomized, controlled cross-over trial of dermally-applied lavender (Lavandula angustifolia) oil as a treatment of agitated behaviour in dementia. BMC Complement Altern Med. 2013;13:315. Seol GH, Lee YH, Kang P, et al. Randomized controlled trial for Salvia sclarea or Lavandula angustifolia: differential effects on blood pressure in female patients with urinary incontinence undergoing urodynamic examination. J Altern Complement Med. Jul 2013;19(7):664-670. Baldinger P, Hoflich AS, Mitterhauser M, et al. Effects of Silexan on the serotonin-1A receptor and microstructure of the human brain: a randomized, placebo-controlled, double-blind, cross-over study with molecular and structural neuroimaging. Int J Neuropsychopharmacol. Feb 2015;18(4). Kasper S, Anghelescu I, Dienel A. Efficacy of orally administered Silexan in patients with anxiety-related restlessness and disturbed sleep - A randomized, placebo-controlled trial. Eur Neuropsychopharmacol. Aug 7 2015. Nikfarjam M, Parvin N, Assarzadegan N, et al. The Effects of Lavandula Angustifolia Mill Infusion on Depression in Patients Using Citalopram: A comparison Study. Iran Red Crescent Med J. Aug 2013;15(8):734-739. Domingos Tda S, Braga EM. Massage with aromatherapy: effectiveness on anxiety of users with personality disorders in psychiatric hospitalization. Rev Esc Enferm USP. May-Jun 2015;49(3):450-456. Soltani R, Soheilipour S, Hajhashemi V, et al. Evaluation of the effect of aromatherapy with lavender essential oil on post-tonsillectomy pain in pediatric patients: a randomized controlled trial. Int J Pediatr Otorhinolaryngol. Sep 2013;77(9):1579-1581. Malachowska B, Fendler W, Pomykala A, et al. Essential oils reduce autonomous response to pain sensation during self-monitoring of blood glucose among children with diabetes. J Pediatr Endocrinol Metab. Aug 15 2015. Dalilan S, Rezaei-Tavirani M, Nabiuni M, et al. Aqueous Extract of Lavender Angustifolia Inhibits Lymphocytes Proliferation of Hodgkin’s Lymphoma Patients. Iran J Cancer Prev. Fall 2013;6(4):201-208. Tayarani-Najaran Z, Amiri A, Karimi G, et al. Comparative studies of cytotoxic and apoptotic properties of different extracts and the essential oil of Lavandula angustifolia on malignant and normal cells. Nutr Cancer. 2014;66(3):424-434. Zhao J, Xu F, Huang H, et al. Evaluation on bioactivities of total flavonoids from Lavandula angustifolia. Pak J Pharm Sci. Jul 2015;28(4):1245-1251. Ziegler J. Raloxifene, retinoids, and lavender: “me too” tamoxifen alternatives under study. J Natl Cancer Inst. Aug 21 1996;88(16):1100-1102. Lantry LE, Zhang Z, Gao F, et al. Chemopreventive effect of perillyl alcohol on 4-(methylnitrosamino)-1-(3-pyridyl)-1-butanone induced tumorigenesis in (C3H/HeJ X A/J)F1 mouse lung. J Cell Biochem Suppl. 1997;27:20-25. Soden K, Vincent K, Craske S, et al. A randomized controlled trial of aromatherapy massage in a hospice setting. Palliat Med. Mar 2004;18(2):87-92. Diaz A, Luque L, Badar Z, et al. Prepubertal gynecomastia and chronic lavender exposure: report of three cases. J Pediatr Endocrinol Metab. Sep 3 2015. Lakusic B, Lakusic D, Ristic M, et al. Seasonal variations in the composition of the essential oils of Lavandula angustifolia (Lamiacae). Nat Prod Commun. Jun 2014;9(6):859-862. Koca Kutlu A, Cecen D, Gurgen SG, et al. A Comparison Study of Growth Factor Expression following Treatment with Transcutaneous Electrical Nerve Stimulation, Saline Solution, Povidone-Iodine, and Lavender Oil in Wounds Healing. Evid Based Complement Alternat Med. 2013;2013:361832. Hawken PA, Fiol C, Blache D. Genetic differences in temperament determine whether lavender oil alleviates or exacerbates anxiety in sheep. Physiol Behav. Mar 20 2012;105(5):1117-1123. Dyer J, Cleary L, Ragsdale-Lowe M, et al. The use of aromasticks at a cancer centre: a retrospective audit. Complement Ther Clin Pract. Nov 2014;20(4):203-206. Kacaniova M, Vukovic N, Horska E, et al. Antibacterial activity against Clostridium genus and antiradical activity of the essential oils from different origin. J Environ Sci Health B. 2014;49(7):505-512.
da Fonseca CO, Schwartsmann G, Fischer J, et al. Preliminary results from a phase I/II study of perillyl alcohol intranasal administration in adults with recurrent malignant gliomas. Surg Neurol. Sep 2008;70(3):259-266; discussion 266-257. Garcia DG, Amorim LM, de Castro Faria MV, et al. The anticancer drug perillyl alcohol is a Na/K-ATPase inhibitor. Mol Cell Biochem. Dec 2010;345(1-2):29-34. Basch E, Foppa I, Liebowitz R, et al. Lavender (Lavandula angustifolia Miller). J Herb Pharmacother. 2004;4(2):63-78. Kemper KJ, Romm AJ, Gardiner P. Prepubertal gynecomastia linked to lavender and tea tree oils. N Engl J Med. Jun 14 2007;356(24):2541-2542; author reply 2543-2544. Kalyan S. Prepubertal gynecomastia linked to lavender and tea tree oils. N Engl J Med. Jun 14 2007;356(24):2542; author reply 2543-2544. Kurtz JL. Prepubertal gynecomastia linked to lavender and tea tree oils. N Engl J Med. Jun 14 2007;356(24):2542-2543; author reply 2543-2544. Dean CJ. Prepubertal gynecomastia linked to lavender and tea tree oils. N Engl J Med. Jun 14 2007;356(24):2543; author reply 2543-2544. Denner SS. Lavandula angustifolia Miller: English lavender. Holist Nurs Pract. Jan-Feb 2009;23(1):57-64. Kasper S, Gastpar M, Muller WE, et al. Silexan, an orally administered Lavandula oil preparation, is effective in the treatment of ’subsyndromal’ anxiety disorder: a randomized, double-blind, placebo controlled trial. Int Clin Psychopharmacol. Sep 2010;25(5):277-287. Franco L, Blanck TJ, Dugan K, et al. Both lavender fleur oil and unscented oil aromatherapy reduce preoperative anxiety in breast surgery patients: a randomized trial. J Clin Anesth. Sep 2016;33:243-249. Karaman T, Karaman S, Dogru S, et al. Evaluating the efficacy of lavender aromatherapy on peripheral venous cannulation pain and anxiety: A prospective, randomized study. Complement Ther Clin Pract. May 2016;23:64-68. Seyyed-Rasooli A, Salehi F, Mohammadpoorasl A, et al. Comparing the effects of aromatherapy massage and inhalation aromatherapy on anxiety and pain in burn patients: A single-blind randomized clinical trial. Burns. Dec 2016;42(8):1774-1780. Yazdkhasti M, Pirak A. The effect of aromatherapy with lavender essence on severity of labor pain and duration of labor in primiparous women. Complement Ther Clin Pract. Nov 2016;25:81-86. Irmak Sapmaz H, Uysal M, Tas U, et al. The Effect of Lavender Oil in Patients with Renal Colic: A Prospective Controlled Study Using Objective and Subjective Outcome Measurements. J Altern Complement Med. Oct 2015;21(10):617-622. Chamine I, Oken BS. Aroma Effects on Physiologic and Cognitive Function Following Acute Stress: A Mechanism Investigation. J Altern Complement Med. Sep 2016;22(9):713-721. Kazemzadeh R, Nikjou R, Rostamnegad M, et al. Effect of lavender aromatherapy on menopause hot flushing: A crossover randomized clinical trial. J Chin Med Assoc. Sep 2016;79(9):489-492. Uzunçakmak T, Ayaz Alkaya S. Effect of aromatherapy on coping with premenstrual syndrome: A randomized controlled trial. Complement Ther Med. 2018 Feb;36:63-67. Bahrami T, Rejeh N, Heravi-Karimooi M, Vaismoradi M, Tadrisi SD, Sieloff C. Effect of aromatherapy massage on anxiety, depression, and physiologic parameters in older patients with the acute coronary syndrome: A randomized clinical trial. Int J Nurs Pract. 2017 Dec;23(6).